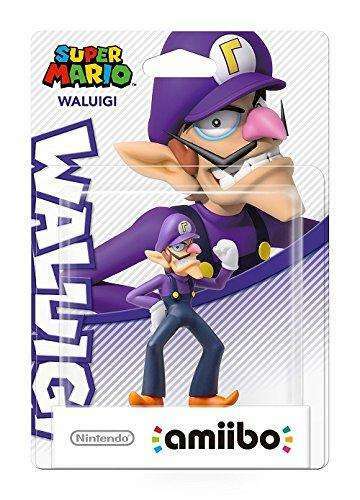 Nintendo AMIIBO: Super Mario – Waluigi (Multi) is part of Nintendo's series of toys-to-life. Amiibo figurines are designed to either store game data or unlock secrets and bonuses in different games played with Wii U or 3DS technology. They're created to take Nintendo games to the next level by allowing players to customize their in-game characters. How Do They Work And What Games Can You Use Amiibo's On? With an Amiibo figure you can store the data of your character through the chip on the bottom of the figurine. Simply scan it on another compatible Wii U or 3DS device and you'll download your character into the game. The Amiibo Super Mario Collection designed by Nintendo includes all the main characters of the Mario Bros game, such as Mario, Luigi, Wario or Waluigi. Waluigi has villain written all over him. With that crooked mustache and red nose, he's not alone in his war against Mario and Luigi. Both he and Wario have hatched some devious schemes together. But Waluigi is the brain behind all the plots against the Mario Bros. If you want to play Mario Kart 8, you can use any of the available Amiibo figures such as Luigi, Mario, Peach, Yoshi, Link, Donkey Kong, Captain Falcon, Kirby, Fox McCloud or Samus. You'll take your gaming experience to the next level when playing with the Wii U Gamepad. However, Nintendo might bring out new characters for Mario Kart 8. Nintendo fans can enjoy a wide range of Amiibo figurines. They offer unmatchable bonuses and rewards along with providing consistency across players' gaming experiences. Wherever you are and whatever compatible device you choose to play with, just download your character into a multi-player game. You’ll have a great time with your friends.